Traub, Courtney. “An Interview with Kevin Begos, Jr“. The Oxonian Review 19.1 (23 April, 2012). Jones, Steven E. “Agrippa, the Eversion of Cyberspace, and Games“. Blog post response to the Traub-Begos interview that suggests thinking ahout Agrippa against ARGs and other transmedia work. 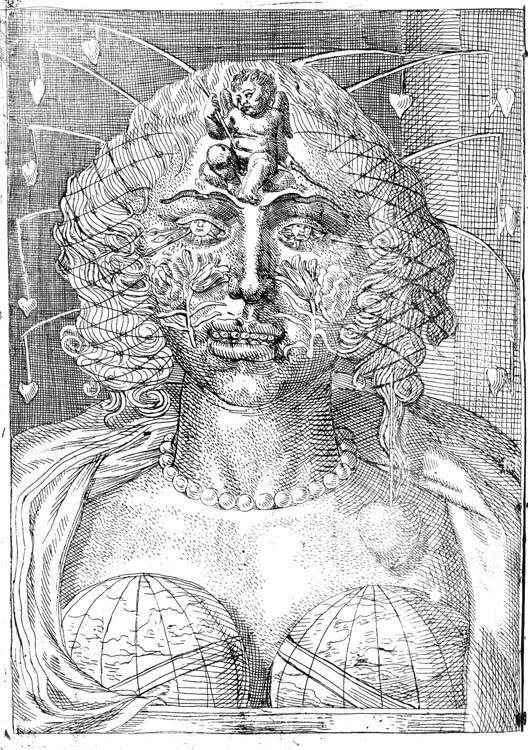 Matt’s Mechanisms: New Media and the Forensic Imagination: Chapter 5 in particular focuses on Agrippa, but the whole book is a great read if you’re interested in new media. Outlining two paths for thinking about new media objects–forensic materiality and formal materiality–the book suggests “forensic imagination” as a path to thinking critically about new media (e.g. considering wear, trauma, time) as textual objects with particular histories and physicalities. Formal materiality concerns itself with symbols and symbol manipulation rather than matter, bits (without material dimensions, just on/off switches) rather than than atoms (with their microscopic but real material dimensions). Kirschenbaum gives the example of shifting ways of interfacing with a digital object–with an image file, for instance, we often end up privileging the “view image” function over other functions that can also be studied, such as those that look at the image file’s metadata or header file. Kenneth E. Foote (1990). “To remember and forget: archives, memory, and culture.” American Archivist 53/3 (Summer): pp. 378-392. Some interrelated thoughts on cyborgs/metaphors/prosthetics. Shelley Jackson’s Patchwork Girl quotes Shakespeare’s Sonnet 130 (“my mistress’ eyes are nothing like the sun”), bringing into a work already quite aware of the mimicries between body and text the idea of blason, the style of poetry that praises but pieces individual pieces of the loved one’s anatomy through metaphor (“she goes on”). Ever since I encountered the etching above, with its parodic response to such blason conceits as eyes like suns darting rays, cheeks like roses, and teeth like pearls, I’ve been unable to read that form of poetry as intended (i.e. describing a harmonious whole); the etching questions whether we can fashion the ideal from constituent ideals. Victor Frankenstein describes his Creature as an almost-functional blason figure (“I had selected his features as beautiful”), but precedes this claim by admitting another qualifier on his choices for materials: “His limbs were in proportion”. As with the etching, the Creature’s monstrosity comes partly from the failure of these parts, beautiful and proportionate as they may be, to coexist. I’ve been thinking about extending these questions of the harmony and juxtaposition of parts of a whole (text/body) to prosthetics, whether these prosthetics are more metaphorical (e.g. prosthetics of memory) or physical additions like our cyborg mobile devices. When my group was developing a Cyborg’s Definition of “Women”, we identified “that species” as a group that faced extinction after failing to make use of certain prosthetics/tools; for Wollestonecraft, the tool in question was education. Success through the use of prosthetics was a mark of cyborghood. With the addition of prosthetics, we’re facing (as with blason) the juxtaposition of disparate parts–except in this case, the metaphors by which we’re extending our bodies aren’t pulling us apart into unbalanced monsters. Certainly they can go either way, but I’m seeing a pattern where metaphors applied onto figures can create monsters like the one in the etching, and metaphors growing out of or chosen by a figure have greater harmony and utility. Perhaps prosthetics are a way of marking these piece-making bodily metaphors not as even more-idealized (and thus less utilizable?) objects, but as tools defined by their individual uses and qualities? I’d be interested in listing and comparing the Creature’s bodily parts with the Patchwork Girl’s; given their gender difference, it’s interesting to see the Creature’s parts as typical of blason inutility (lustrous black hair!) while the Patchwork Girl’s parts are defined (sometimes indirectly via anecdote) by their abilities to dance, dissemble, act. Photo of Mac Classic wearing "Mac cozy" and running Deena Larsen's Marble Springs. For our group teaching tomorrow, Kristin Gray, Kathryn Skutlin, and I will begin class by demoing various forms of e-lit, followed by an e-lit exercise where you’ll re-imagine a pivotal scene of Frankenstein through the possibilities of e-lit (we’ll pass out handouts in class, but if you want a digital copy you can download this or see the assignment on my personal blog). Both Michael Joyce’s afternoon and Deena Larsen’s Marble Springs can be purchased from Eastgate Publishing. 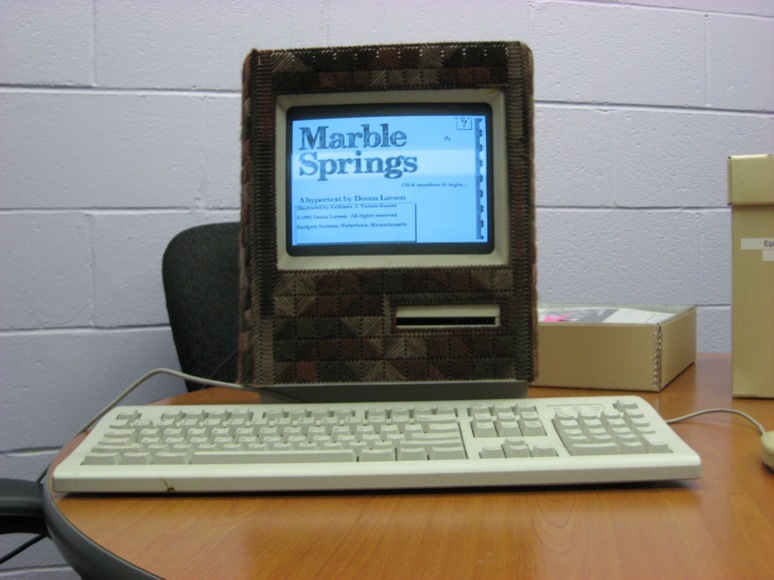 Or… make an appointment with MITH to read these and more e-lit on the original hardware, or visit the Deena Larsen Collection site to read more about Larsen’s work or watch a short video demo of Marble Springs. Larsen’s “Fun da mentals: Rhetorical Devices for Electronic Literature” is a fantastic site teaching basic approaches to writing e-lit. Caitlin Fisher’s These Waves of Girls is a 2001 Flash-based work. The Urban 30 is an example of a “fictional blog” based on WordPress (just like this site–well, the WordPress part! ); in this case, multiple writers uses the blog community to write in as fictional characters. Urban 30 is particularly interesting because it tells a superhero story, a genre that was born and lived for a long time solely in comic books. The 21 Steps is a story told through Google Maps. Notice how this platform complements how important location is to the story. “Haircut” uses YouTube to create a choose-your-own-adventure video. If you’re curious how to do this, check out this tutorial on creating annotated YouTube videos. Stories created using texts and Twitter have taken off; “mobile phone novels” are especially popular in Japan, where this article claims they’ve “become so successful that they accounted for half of the ten best-selling novels in 2007.” This short article gives a sense of the kinds of stories people write via Twitter. In addition to individual-authored Twitter stories, large groups of strangers have used this platform for communal writing. The LA Flood Project was an event that encouraged Twitter users to tweet (with an #laflood hashtag) as if they were experiencing an apocalyptic flood in L.A. This page gives the brief timeline participants were supposed to follow; you can search Twitter for #laflood to see the story unfold, though it was most exciting in real-time (the latest tweets are just people rehashing the week-long event). And finally, the Electronic Literature Organization (ELO) hosts the Electronic Literature Collection 1 and Collection 2, which display a wide variety of approaches to electronic writing. I spent my bus ride home thinking about what it might mean to hack a book. I’ve seen beautiful sculptures made out of books (like these: one two three four) as well as more readable, but still fundamentally remixing acts of book hacking in the form of “altered books” like A Humument and Jonathan Safran Foer’s deliberately altered The Tree of Codes. Even more than book art, however, thinking about designing digital editions of paper books has helped me start noticing the individual mechanics of the vehicle, and it feels like outlining just what a book does is a good step toward making it do things it “shouldn’t” (i.e. hacking). Although we’re not talking about digital literature yet, it could be useful to contrast books on-screen and off if we want to start pointing to what makes a book work (or, you can check out this “Medieval Help Desk” video and think about the happy differences between scroll and book!). writeability (who hasn’t wished they could jot down notes on the PDF they’re reading online?). As we look at how Blake hacks the book, can we add to Matt’s list of book affordances? In addition to broad characteristics, we might list specific elements such as the datedness of page numbering on the Nook or the (un? )necessary pause when “flipping” pages on a Kindle. Why were these technologies useful in books, and awkward (or nostalgic) in e-books? *Kirschenbaum, Matthew. “Bookscapes: Modeling Books in Electronic Space”. Human-Computer Interaction Lab 25th Annual Symposium. May 29, 2008.